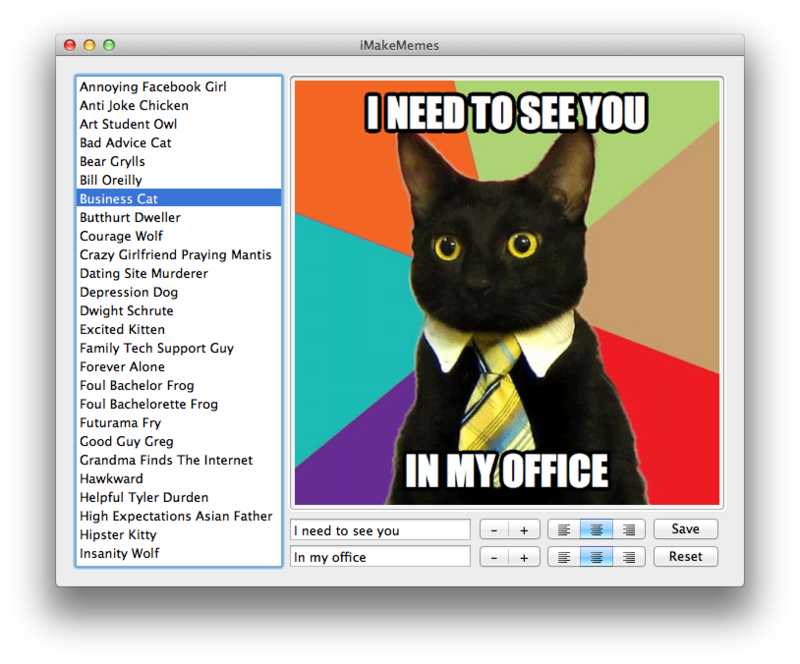 If you can’t get through the day without a Business Cat, a Foul Bachelor Frog or an Excited Kitten, this app is for you. If you have no ideal what we’re talking about, it probably isn’t for you. iMakeMemes was knocked up by Reddit user Michael Fogleman with the express purpose of making it as easy as possible to generate your own meme images. He announced it on the link sharing site earlier today, as Electric Pig spotted. You just select the image you want, add the text, adjust its size and alignment to suit, and save. Simple. Similar tools already exist online but this is a Mac-native alternative that is certainly quicker. Potential additions to the app in the future include the ability to use your own images and upload straight from the app. A lot of the common meme images are on here, although we have to say “Y U NO HAVE ‘Y U NO’ GUY?’. iMakeMemes is a free download, although there’s an option to donate to the developer from the website.